This is the part number 13 of the serie on the WPF 4.5 new features. 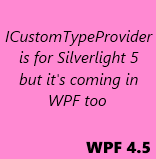 ICustomTypeProvider is an interface already known in the Silverlight 5 world but it is shipped with full support in WPF 4.5 too. In this post we will discover what is the interface ICustomTypeProvider and how it can be used in WPF 4.5 ! ICustomTypeProvider : what is it ? You may already know the ICustomTypeDescriptor (notice the ‘Descriptor‘ instead of the ‘Provider‘) interface as you are all WPF fans :-p ! This interface let you decide what information your type will expose when reflection is used. Binding uses reflection… So by implementing this interface you can define a set of dynamic properties and create binding targeting them. This is particulary useful when you are building a framework or when you know the properties name only at runtime. ICustomTypeProvider is basically the same thing but it is lighter and designed for Silverlight at start. Binding to Dynamic Properties with ICustomTypeProvider (Silverlight 5 Beta) by Alexandra Rusina. SL5: ICustomTypeProvider by Matthiey Mezil. The MSDN page on it. The thing to read in this post is that there is an helper class which helps you to create dynamic types. You can find an updated version of Alexandra’s one on Matthieu’s blog. The helper class does not works out of the box for WPF. Some pieces are actually missing for it to work 🙂 but the fixes are not too hard to implement. If you want to discover what is this struct RuntimeHandle and its purpose, read this post from Vance Morisson. 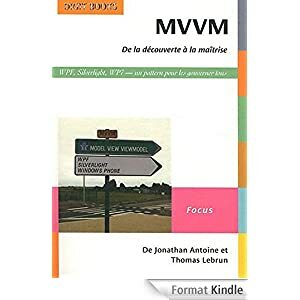 How do I use it in my WPF app ? With the helper you can create types dynamically. In the demo project on my dropbox folder (registration link), I create a class named ‘MyNewClass’ and add a property ‘Name’ to it in a static constructor.